Every Sunday, 13:00 GMT (+00:00). BW Jeez weekly 01 @ January 6, 2019 (Aztec) - ZeLoT US$ 353.82. BW Jeez weekly 02 @ January 13, 2019 (FS) - Dandy US$ 87.89. BW Jeez weekly 03 @ January 20, 2019 (Roadkill) - Shine US$ 94.57. BW Jeez weekly 04 @ January 27, 2019 (Heartbreak Ridge) - Dewalt US$ 82.16; ClickMer US$ 82.16*. BW Jeez weekly 05 @ February 3, 2019 (Medusa) - ZeLoT US$ 157.16. BW Jeez weekly 06 @ February 10, 2019 (Colosseum II) - Shine US $76.31. BW Jeez weekly 07 @ February 17, 2019 (Circuit Breakers) - Shine US$ 75.47; EOnzErG US$ 75.47*. BW Jeez weekly 08 @ February 24, 2019 (Overwatch) - EOnzErG US$ 103.51. BW Jeez weekly 09 @ March 03, 2019 (Ground Zero) - Shine US$ 174-. 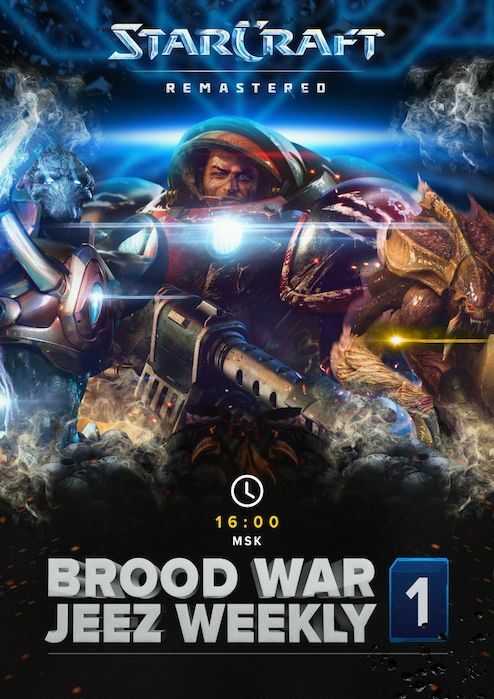 BW Jeez weekly 13 @ March 31, 2019 (Colosseum) - Terror US$ 149.82*. BW Jeez weekly 16 @ April 21, 2019 (Circuit Breakers) - Shine US$ 78.07; Terror US$ 78.07*. * Special performance bonus. In particular for defeating a Korean pro. ** In case of unplayable lags, the referee reserve the right to forfeit the match. Ping to Moscow, Russia is considered a master sample. Please read how to make your account @ GoodGame.ru here. Please see how to switch the tournament module to English (for logged in users only). Format: Single Elimination, Best of 1. You must save your replays. Replay unavailability may result in prize detention. Referees: Rus_Brain, Yoda, saerjaar, Plumbum, KrastyKrabs, 7xSurprise, pG2k. lets see what is on the pipe this time.but more starcraft action in 2019 lul.i guess i will never quit. The format of the tournament - Single Elimination, until the first victory in each meeting. Exactly, no mistakes! Bo1 in all rounds, including the final one, which makes both the 5-pool and 3 huts to the pool quite working strategies! Woah Single - elimination is really exciting! i guess i will never quit. Again, too early for me. GL to everyone. Is really difficult to register if ure not russian t.t mb change to challonge? Submitted complete list of tournaments. 1 F*cking YEAR OF MORTAL KOMBAT ? OMEGE !!!!!!!!!! !